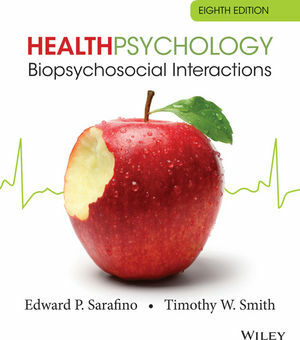 Authors Ed Sarafino and Timothy Smith draw from the research and theory of many disciplines in order to show how psychology and health affect each other. The 8th Edition of Health Psychology: Biopsychsocial Interactions has been updated to include a broader picture of health psychology by presenting cross-cultural data. Additionally, international examples are included to broaden the psychologist’s view of health issues around the world and highlight what works in the field. The psychological research cited in the text supports a variety of behavioral, physiological, cognitive, and social/personality viewpoints. A focus on lifespan development in health and illness is integrated throughout the text. Cross-cultural data. The latest available data on health and lifestyles in 14 countries is presented to provide students with a broader picture of health psychology. Illustrations. Data has been updated in several figures and new ones added to clarify physiological processes and to present interesting and important data. Includes three different types of boxed features "Highlights on Issues," "Assess Yourself," and "Clinical Methods and Issues" to help give readers context for the material. The “Highlight” feature focuses on high-interest and in-depth topics such as careers relating to health and psychology. The “Assess Yourself” feature has readers actively examine their own health-related characteristics such as lifestyles and ways of coping with stress. Finally, the “Clinical Methods and Issues” focuses on methods and issues in application efforts in clinical health psychology, medicine, public health, and rehabilitation. Lifespan development in health and illness is integrated throughout the book and each chapter contains information dealing with development. Each chapter concludes with a substantial Summary and a list of Key Terms for readers to review and reflect on chapter topics and content. Interactive animation notices are placed throughout the text for each interactive animation -- featured on the complimentary Student Companion Site -- when relevant material is presented.